Status: Uncommon, locally common, regular spring and fall migrant statewide. Documentation: Specimen: UNSM ZM6127, 24 Oct 1897 Lancaster Co. There is an earlier record of one bird at Smith WPA, Clay Co 16-23 Mar 2012. There are few reports during Apr, and peak migration occurs mid-May; based on high counts, peak numbers are found 10-21 May. There are fewer than ten reports in Jun; later Jun dates and two early Jul reports (see Fall), may be one-year old non-breeders not completing migration. 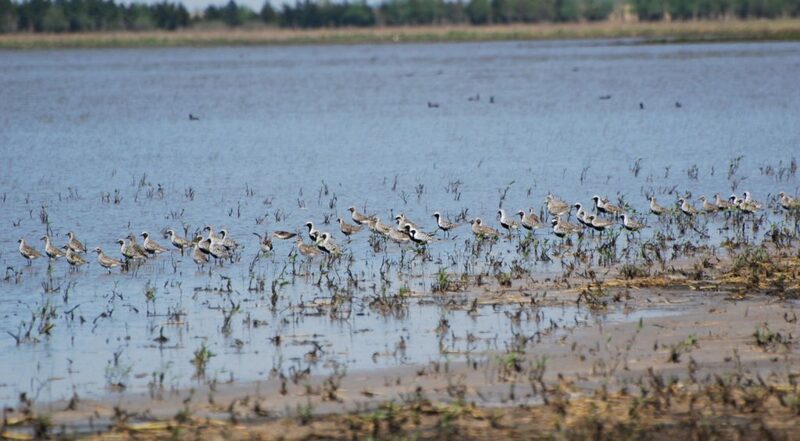 By far most migrate in spring through the east-central part of the state, centered on the Rainwater Basin. High counts: 588 in the Rainwater Basin 18 May 2005 (including 207 near Kenesaw, Adams Co), 469 there 10 May 2000 (including 334 at Harvard WPA, Clay Co), 200 there 12-13 May 2008, and 200 there 21 May 2011. Adults are observed from the end of Jul through Aug, with most reports 12-20 Aug. Adults are always scarce during the southward migration, as noted by Jorgensen (2012) in the Rainwater Basin, where there are only seven records of adults. Juveniles are more numerous than adults and are observed from Sep through Oct and casually into early Nov. There are earlier reports (see Spring) 3 Jul 1980 Lincoln Co and 8 Jul 2006 Valentine NWR, Cherry Co, and a later date 17 Nov 1935, one collected near Hastings (Swenk 1936). High counts: 43 at Lake McConaughy, Keith Co 26 Oct 2000, 40 there 20 Sep 2006, 28 juveniles at Lake North, Platte Co on 17 Sep 1995, 24 juveniles in Clay Co 18 Oct 2008, 19 adults at Lake Babcock, Platte Co 15 Aug 1998, and 17 juveniles there 2 Oct 1998. Comments: In Apr, observers need to carefully identify Pluvialis plovers. Molting American Golden-Plovers can resemble Black-bellied Plovers, resulting in occasional reports of flocks of the latter in Apr, an occurrence not to be expected. Black-bellied Plovers at Harvard WPA, Clay Co 9 May 2008. Photo by Joel G. Jorgensen. Swenk, M.H. 1936. The 1935 Migration Season. NBR 4: 13-19.